"Before you can talk about social justice, you have to follow Jesus." 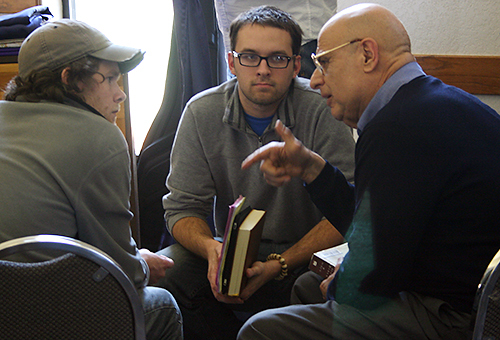 That’s how Tony Campolo began the first of two presentations to nearly 130 participants at the Retreat on Social Justice, held March 11-12 at Canyon Camp. The event drew Oklahomans of several denominations, and it was sponsored by the Oklahoma Conference’s Board of Church & Society and Peace With Justice Committee. Rev. Dr. Campolo is the author of more than 35 books and an internationally recognized media commentator on religious, social, and political issues. The 24-hour retreat offered growth, reflection, and dialogue on some key social issues. 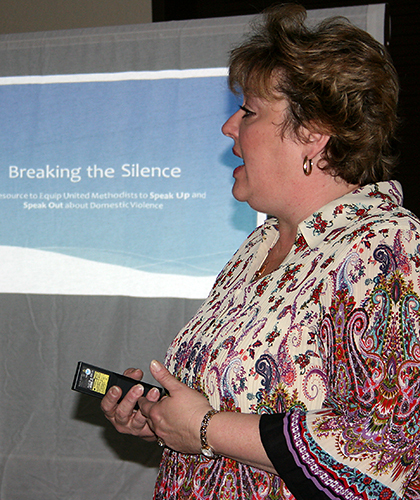 "The conversations were real and particularly relevant to what’s happening all around us," said one participant. Bishop Robert Hayes Jr. added his passionate voice to the gathering as preacher for the opening worship experience. On Saturday morning, Jim Winkler, who is general secretary of the denomination’s General Board of Church & Society, highlighted opportunities for everyone to be engaged socially and politically. "To seek justice is part of witnessing on behalf of Jesus Christ," he emphasized. As chief executive of the General Board, Winkler leads in the implementation of The United Methodist Church’s Social Principles through education, witness, and advocacy. The board carries out a wide-ranging ministry of peace and justice throughout the world. Offices are in the nation’s capital and New York City. Winkler said there is a misconception about what the Church can and cannot do. "We can hold forums, discuss political issues, take petitions to the Capitol. We can even have candidates speak. However, we can’t endorse a particular candidate. We can’t do political fundraising and cannot espouse a United Methodist candidate above all others," he explained. Winker’s morning address effectively laid the foundation for the day’s workshops, on topics ranging from restorative justice to immigration, gambling, and "Caring for Creation." Each workshop offered information and encouraged participants to engage each issue from the perspective of faith and social justice. Still, at the heart of the weekend were Campolo’s addresses, which most appropriately framed the event’s theme—"Social Holiness: On Earth as It Is in Heaven"—within current realities of ministering to those who are poor. A member of the American Baptist Church, Campolo describes himself as "an evangelical with a social conscience." He said, "Social justice is nothing more than love translated into public policy." He challenged the group to take seriously the task of ministry to "the least and the last," and reminded his audience that there are more than 2,000 Scripture references to ministry with the poor. "We must move from being a believer to being a disciple," he said, "an imitator of Christ," who called all to care about the needs of the poor. And when that call seems hard to fulfill, he pointed modern disciples to Jesus’ resurrection, proclaiming, "It’s Friday, but Sunday’s coming." The retreat was the first of what is hoped to be ongoing social justice education developed by the Conference’s Board of Church & Society.